Really Useful Boxes™ for storage. Curious if anyone has experience with Really Useful Boxes used as storage--and if so could you provide some advice? I was initially interested based on the review of their scrapbook drawers on brickset. Unfortunately on their US site I can't find the divider inserts for the drawers, and in thinking about my situation more (I need to organize for myself and my two young kids) I think that boxes might be a better option for me anyway. So right now I'm looking at their 11 liter boxes with inserts. To be honest I feel like at 18" x 14" they'll one on the big side for my kids to carry around at build time--however the 4 liters look a bit small and don't have good inserts. Assuming that I do get the 11 liter, there's 3 choices for the insert--dividing it into 6, 12, and 16 compartments. This is where I could use some advice--considering we have a pretty typical lego collection roughly around 8,000 pieces, what sort of configuration would be best? I could do a mix of the 3 sizes but my gut is telling me that I'll be most happy with the 16 (this is also closest to the size recommended in the brickiest review). Do a search on here for Really Useful Boxes. There was a lot of discussion around a year ago, IIRC. If I remember right, they were pretty expensive, and not readily available in the US, but I think I’ve seen them at Office Max. Oh, ha! Yes there is quite a few discussions. I really thought I had searched! I have a couple of the large Really Useful Rainbow storage towers with 11 A4 sized drawers. Think they are 9L drawers, but can't find it online to check. The tower measures 121 x 42 x 30 cm. I use the box tray inserts trays for the 9L storage boxes in the drawers which are perfect with 6 smaller compartments and one larger. Think the tower was about £40 and the trays about £3 each. Another option is the 9L storage box with tray inserts. You get two trays in each box which fit perfectly and remain dust free and easy to access. They are around £10 each in the UK and you can get a lot of Lego in them. In my experience the 4L was too small and the 11L too large. Certainly the trays with 12/16 compartments were too small for anything other than the smallest pieces. Certainly worth looking at the 9L box with trays. If you can't find them I'll try to post a link. At least on the US site I had trouble finding inserts for the drawers... and with the little kids I kinda like the idea of a lockable box for transporting around the house. I ended up ordering four 11L with 16 compartments and one 4L with two trays (we do have quite a few very small parts—Minifig accessories and the like). Hopefully it’ll work out. I made an assumption that 16 compartments in an 11L would work since the review said that the 15 compartment for the scrapbook drawers was adequate. Fingers crosses they work out. Worse case I could always swap out the inserts. Regardless this will be way better than the current “big unsorted tub of legos” we’ve been using to build the last couple years. Depending on your kids, beware oversorting. I've got bunches of Akro-Mils type drawers for small parts and bigger drawers for other parts, but also keep a couple of fairly large tubs that I stocked from sets like #10404. When my grandson and I are building together we dump the whole lot onto a bedsheet in a big pile. There's something about rummaging through a pile of a couple thousand parts that cannot be replaced. But it sure is nice to have stuff sorted into lots of drawers when trying to find a specific piece. 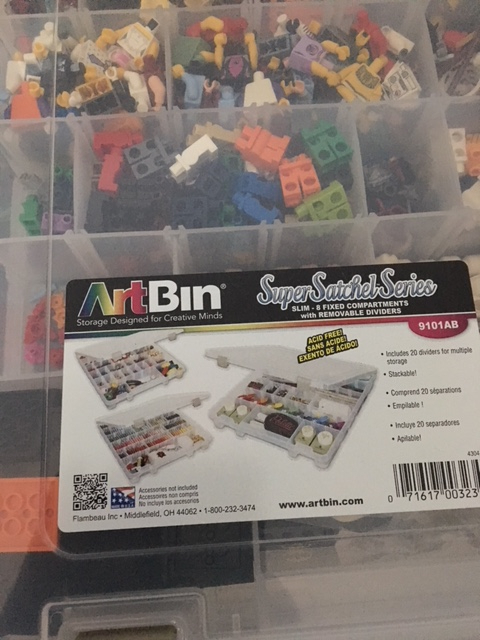 @hayduke - Another suggestion could be the Artbin Super Satchel Series once you have taken @datsunrobbie 's advice into account about over sorting. We found that in the beginning we used them for minifig parts and have since expanded considerably. I currently use the slim (model 9101AB) and the next size up (model 9007AB). I wait for them to go on sale at Joann Fabrics and go get some more. Currently they are listed on the website for $11.99 and $13.19 respectively. The dividers can be purchased separately on Amazon although they are not always in stock. Just another option for you to consider. ^ I use the above for Lego dimensions sets. Highly recommended! How can people stand to leave the stickers on? For one thing, it partially defeats the purpose of having a transparent container. Totally understand. What gets me is when I’m at someone’s house and they have plates, or utensils, or food storage containers that have baked-on store stickers on them that would have been easy to remove if they just did it before washing the item.